Looking W at S end of cottage. Monday afternoon we took the opportunity of a break in the weather to excavate down through the chalk rubble backfill which formed the foundation for the ~1880 extension’s floor. 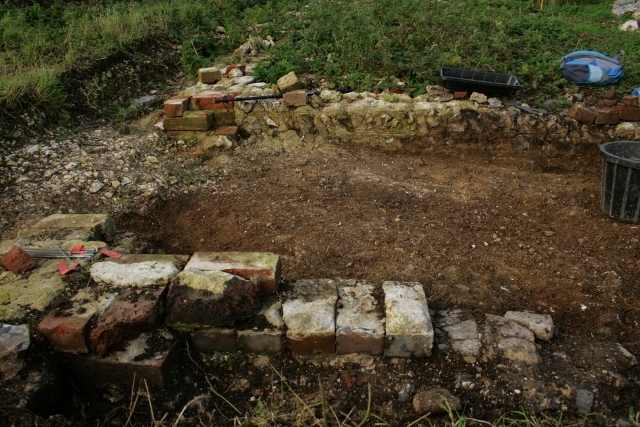 A sondage dug back in May found a mortared surface under this chalk rubble fill. Because the east end of the extension was lost to the 1950 bulldozer, we hoped that following this mortar foundation might better reveal its full extent. Composite photo looking N at S end of cottage; click for higher resolution. This was our ‘level’. Except it wasn’t horizontal, and seemed to generally slope downhill, perhaps following the original ground surface. Assuming the floor surface above was horizontal, the chalk rubble would have been used to level off the floor. We need to put a spirit level onto the double lines inscribed in the mortar – they should line up the flintwork courses to those of the brickwork; if they are approximately horizontal, then over a 4m length we have a drop of about 5 courses. However, over the estimated length of the extension, a little over 2m (internal), the top of its mortar foundation had a drop of about 2 or 3 brick courses from west to east. 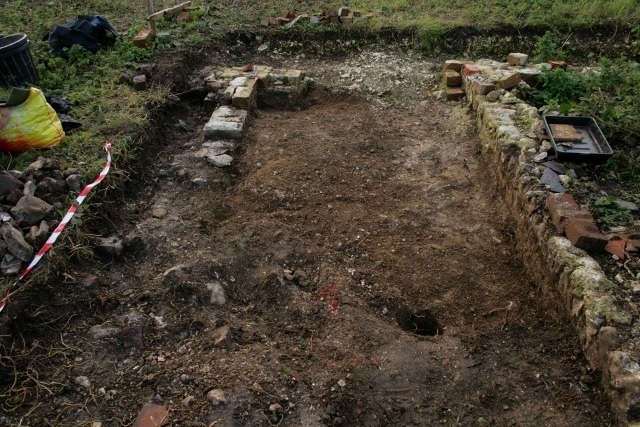 Looking W at foundations of extension at S end of cottage. 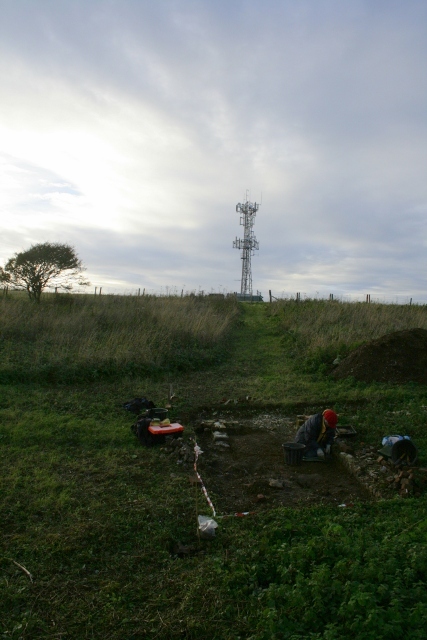 Unfortunately we ran out of time to fully excavate the far eastern end of the extension, so the exploration of the remaining evidence for the location of its lost wall will have to wait till next time we dig. Fragment of 19thc. clay pipe stem. As expected, almost nothing was found; the single shard of window glass and a rusty piece of metal were almost certainly from outside of this context. However a short length of 19thc. 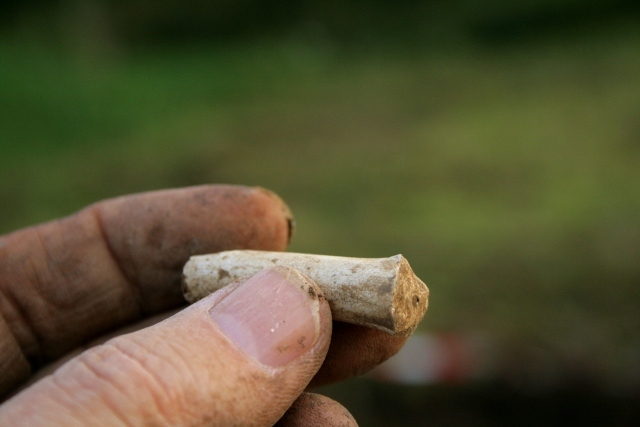 clay pipe stem, may well have been in situ. Our next planned dig day is Friday – weather permitting. We would love you to join us – no experience required. We will be preparing the site for our guided tour on the 2nd & 3rd Nov.
We meet at the car park near the junction of Bexhill Road and Falmer Road, just north of Woodingdean, at 10am. Please don’t hesitate to give me a call for further info.